Our objective is to offer superior application of braking power on the new Oltre XR3 Disc, enabling you to ride faster, maintain a more consistent overall speed, and even save energy. 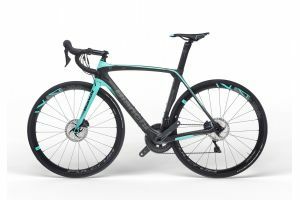 The new Oltre XR3 benefits from the same revolutionary frame-design developments proven at the highest level of racing on the acclaimed Bianchi Oltre XR4. and the competitive advantage of advanced aerodynamics. Bianchi allows you to ride perfect lines at the optimum speed – for every single corner, rain or shine. equipped frame and the consistent power, precision and modulation of disc brakes, makes the new Bianchi Oltre XR3 Disc the ideal handling fast aero road bike - on any road, in any weather. while maintaining the Oltre’s aerodynamic advantage. The underlying technology used in the XR3 – Countervail®, exclusive to Bianchi CV models – cancels the vibration resulting in increased control and reduced muscle fatigue. The result with the Oltre XR3 is a smooth ride and a racer who can stay focused in their fastest, most efficient aerodynamic position for longer. while increasing the stiffness and strength of our carbon frames and forks. cycling and proven in the extreme conditions of NASA aerospace operations.